Last summer my book club thoroughly enjoyed reading and discussing Sue Monk Kidd’s 2014 historical novel Invention of Wings. 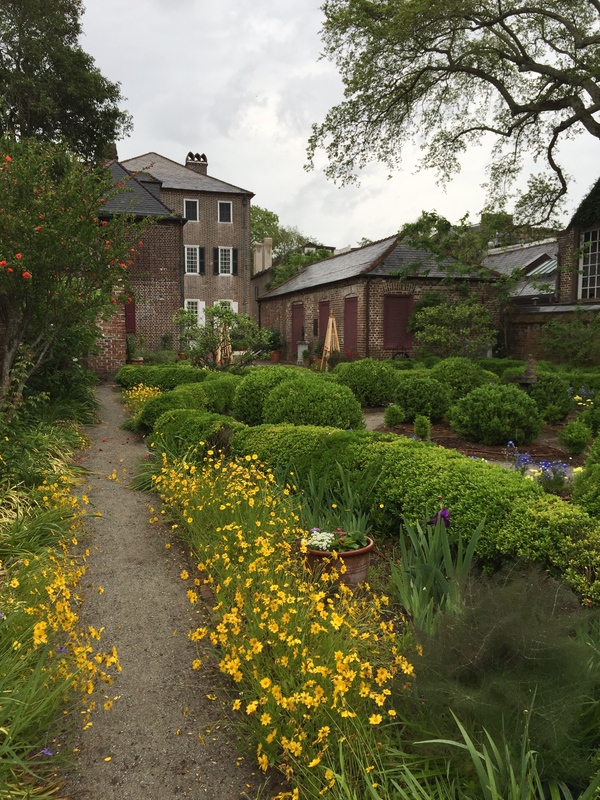 Ever since then, a trip to Charleston was high on my travel wish list. I wanted to walk in the footsteps of Sarah and Angelina Grimké, as well as their house slaves Hettie and Charlotte. 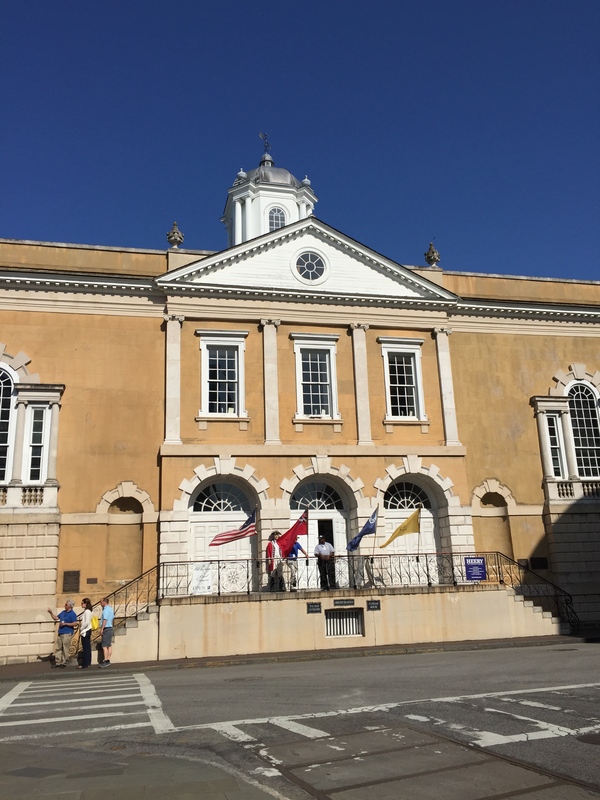 I’ve recently returned from a long weekend in Charleston and that’s exactly what I did, thanks to Carol Ezell Gilson and Le Ann Bain’s “The Original Grimké Sisters Tour,” which I highly recommend. 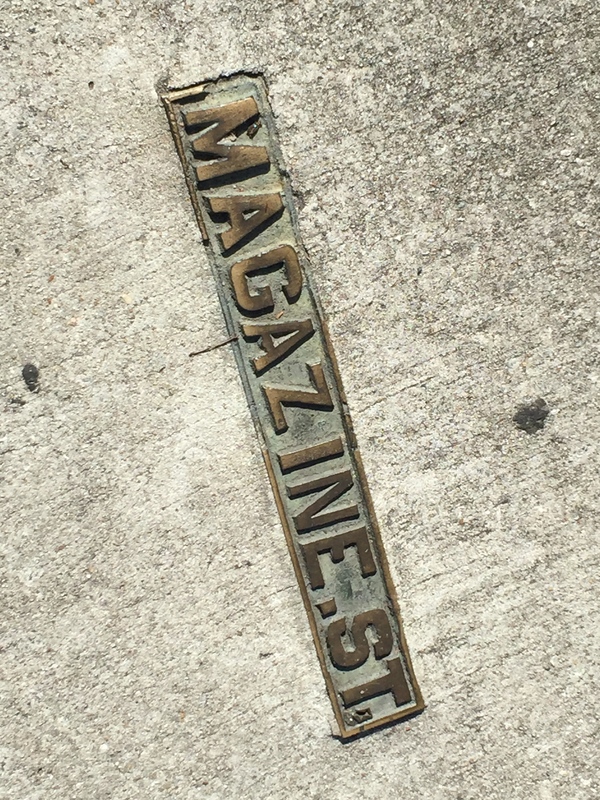 Follow along on my photo tour until you can get the chance to go to Charleston yourself. 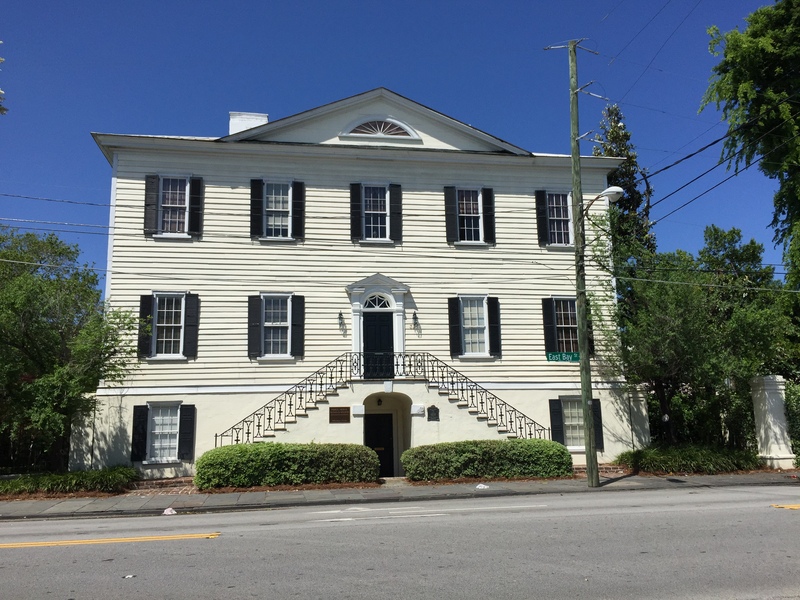 The Grimké Family Home at 321 East Bay Street in Charleston (1803-1819). The Grimkés moved here when Sarah was 11 years old. Angelina was born here in 1805. Most of the events from the Invention of Wings takes place here. The front door of the Grimké family home at 321 East Bay St. The Grimkés had 9 children, including 3 teenagers, at the time they moved to this house on East Bay. They’d run out of room at their prior house on Church Street. The back of the Grimké house at 321 East Bay St. 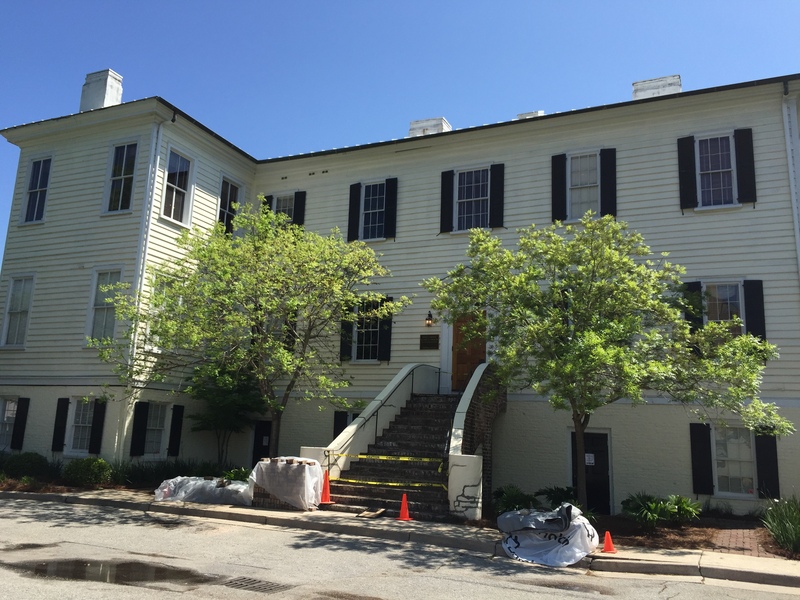 This is now a parking lot for the law firm that owns the building, but it was once the site of the out buildings, including the outside kitchen and slave quarters. 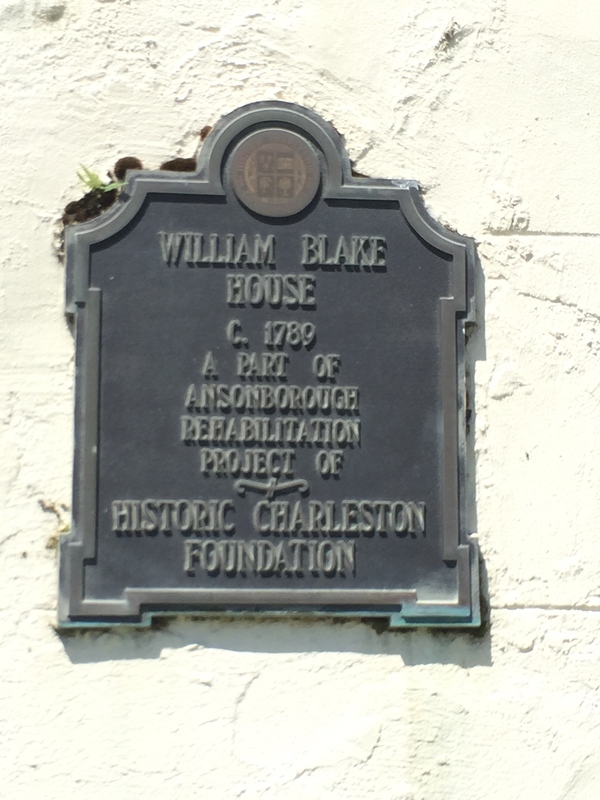 As of April, 2015, this is the only historical marker on the former Grimké home on East Bay. 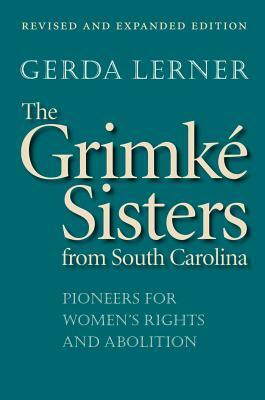 However, there are plans to place a commemorative marker at the site on May 5, 2015 to recognize the home of the Grimké Sisters. I understand that Sue Monk Kidd will be there as a part of her book tour for the paperback launch of Invention of Wings. The view from the front door of the Grimké home on East Bay. 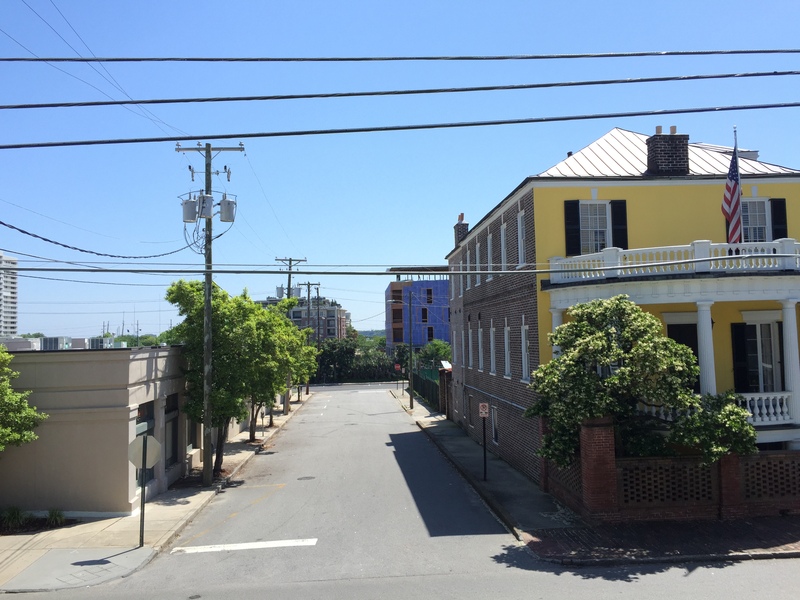 Charleston Harbor can be seen behind the buildings toward the back. Sarah Grimké would have been old enough to notice the slave ships arriving in the harbor before 1808, the year that foreign slave trade was abolished in the United States. 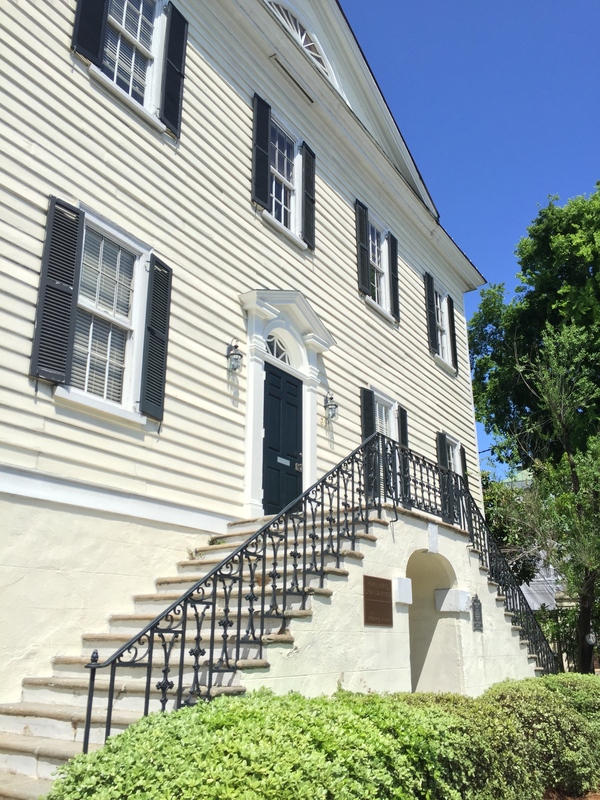 The Grimké family home from 1794-1803 was located at 87 Church Street in Charleston. 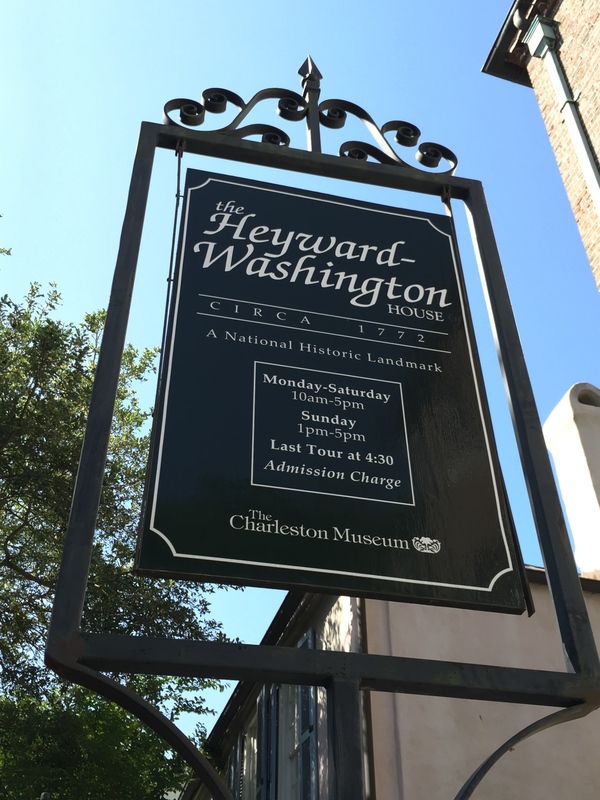 It is now known as the Heyward-Washington House and is part of The Charleston Museum. The home has been restored and preserved circa 1772, back when the Heyward family lived there. 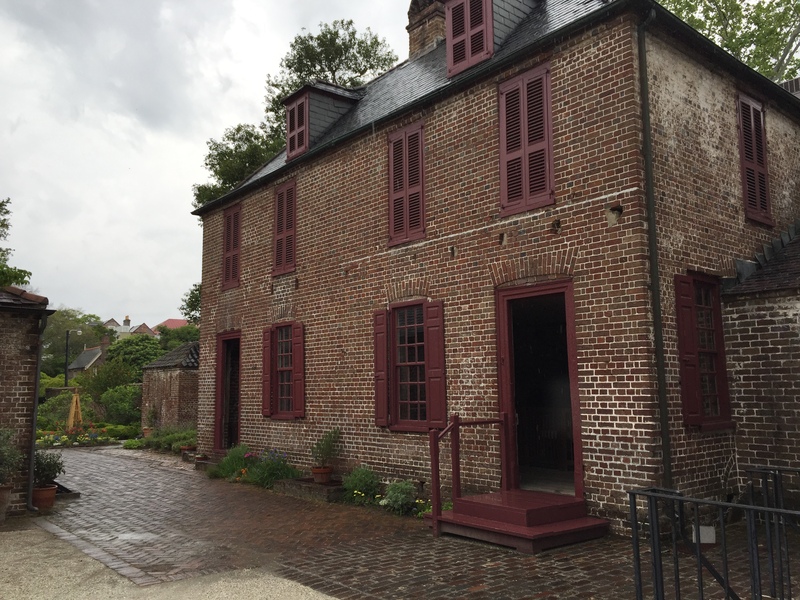 It is also named after George Washington, who visited Charleston and rented this home in 1791. 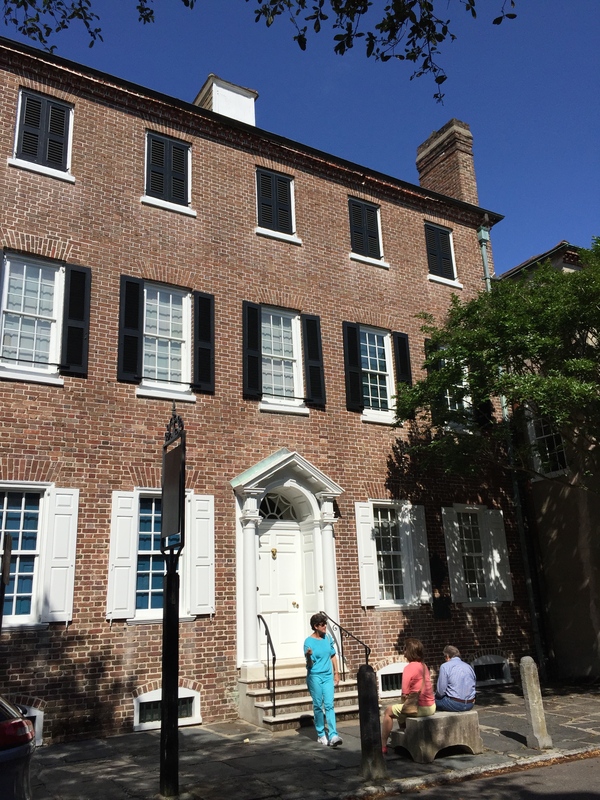 The Grimké family home on Church Street from 1794-1803 (the Hayward-Washington House). I highly recommend that fans of Invention of Wings take a tour of this house in order to get a real feel for the manner in which the Grimkés and their slaves lived at the time. Tickets and other details are available here. 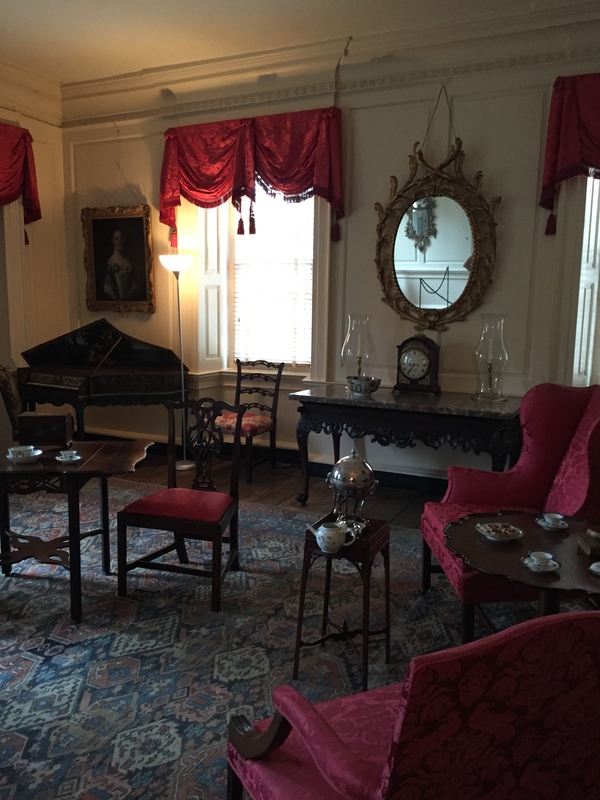 The lovely drawing room of the Heyward-Washington House overlooking Church Street. The furniture pieces are 18th century handmade antiques, many of which are original to the house. 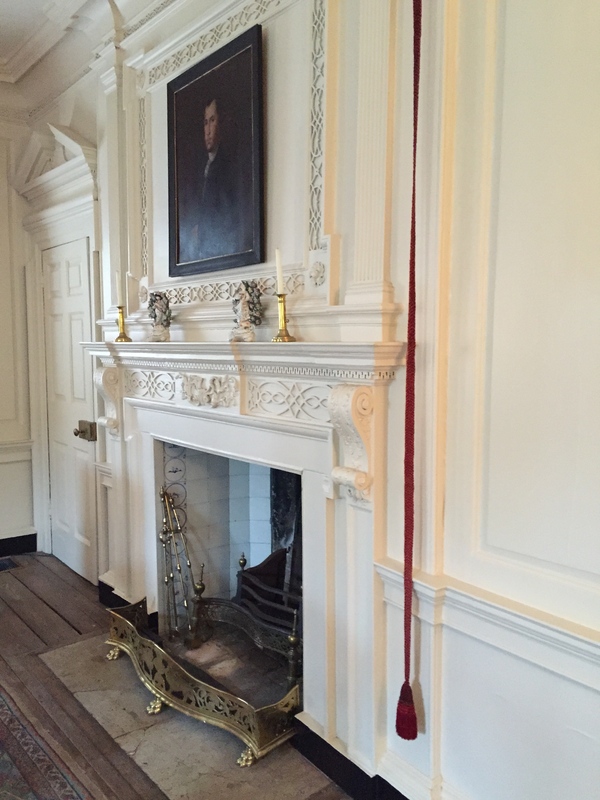 The fireplace in the drawing room of the Heyward-Washington House, next to which is a bell-pull for the attending house slaves. 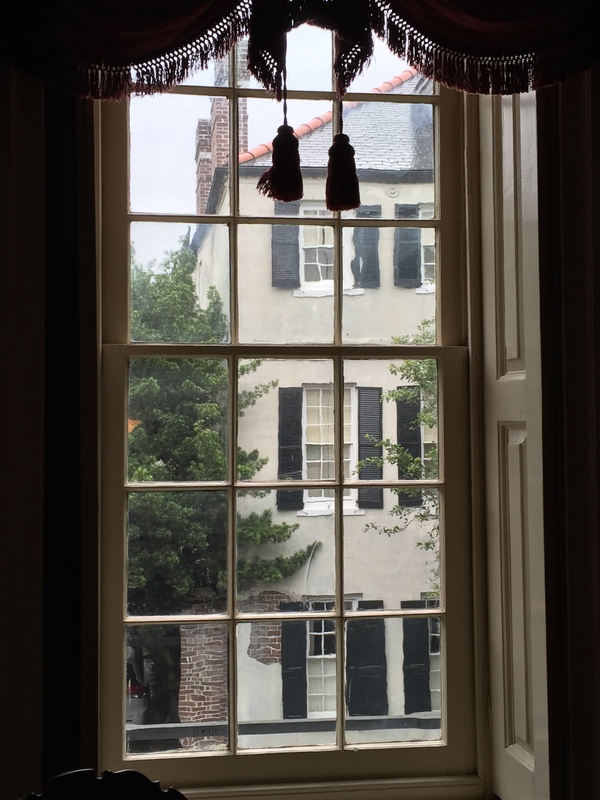 The view from the drawing room of the Heyward-Washington House onto Church Street. 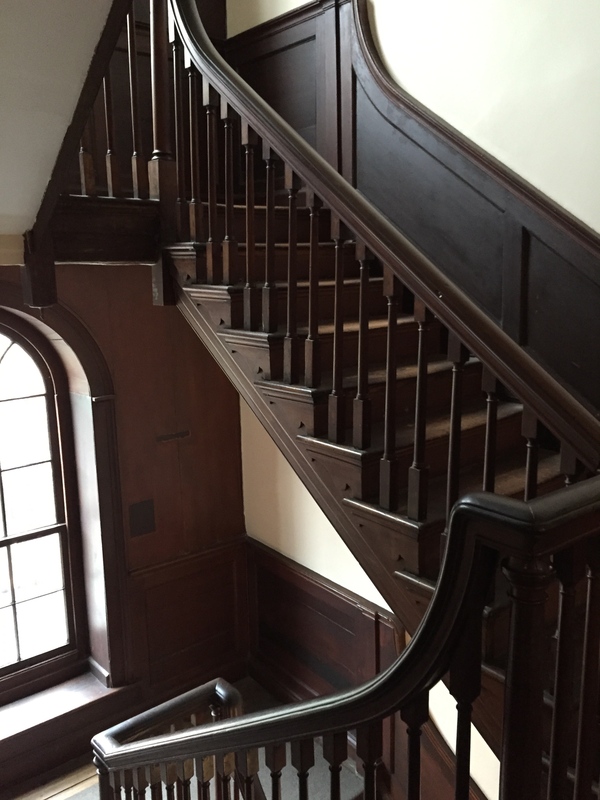 The stairs from the second floor landing. Sarah Grimké would have lived in a room on the third floor along with her other siblings. So, both Sarah Grimké and George Washington have touched this banister. Pretty cool. One of the out buildings at the Heyward-Washington House. The downstairs included the kitchen and laundry room and the upstairs was slave quarters. This helped me picture what the backyard of the Grimké home was like for Hettie and her mother. 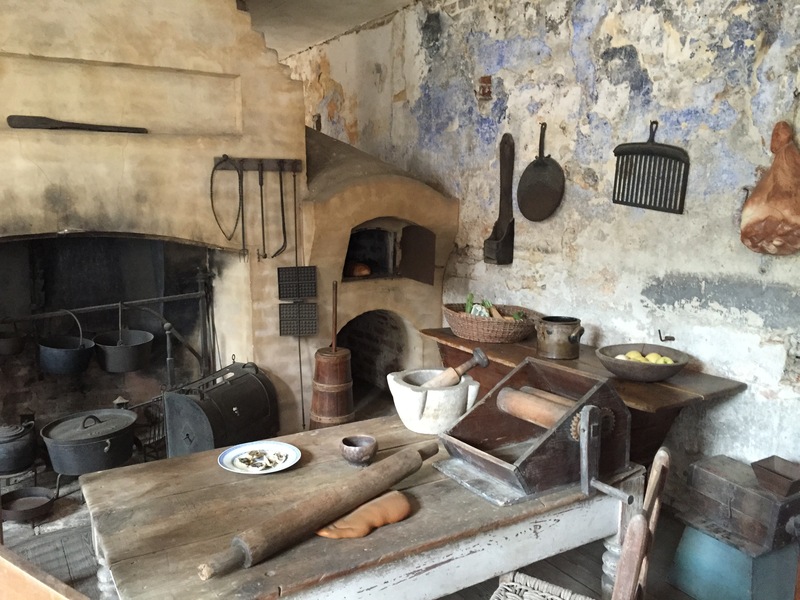 The kitchen of the Heyward-Washington house. This is where Hettie’s Aunt-Sister spent most of her time as the head cook. 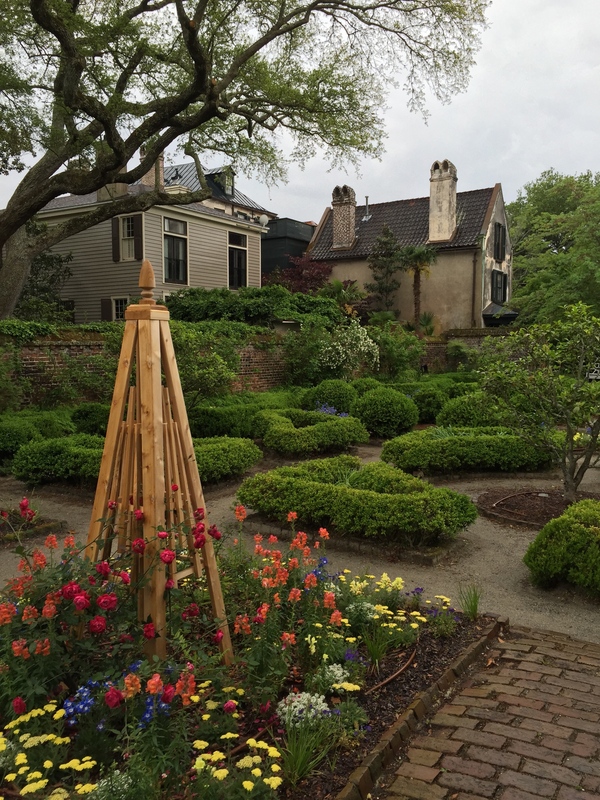 The back gardens of the Heyward-Washington House. This is where Sarah Grimké, at age 5, would have first observed a slave being beaten. It disturbed her so much that she ran out of the house and down to the wharf, where she reportedly asked ship captains to take her to a place that didn’t have slavery. 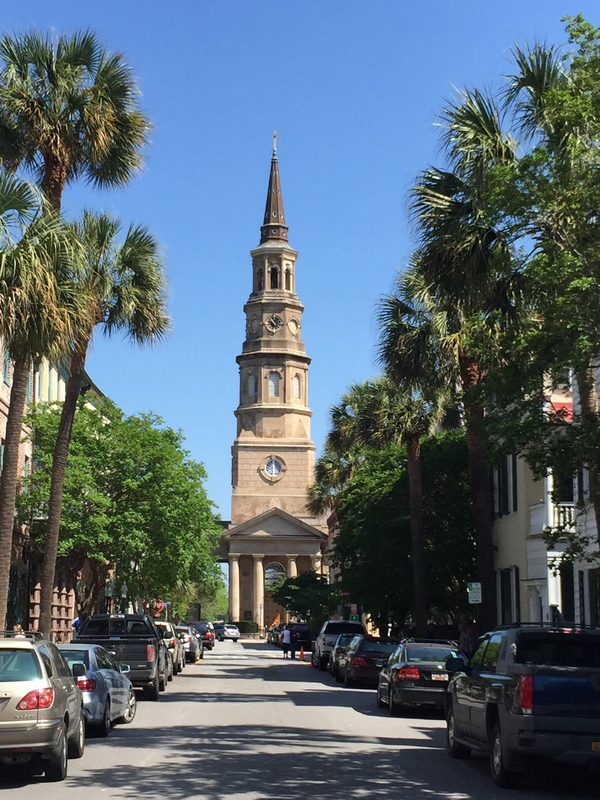 St. Philip’s Episcopal Church, Church Street in Charleston. As Sarah says in Invention of Wings: “On Easter, we Grimkés rode to St. Philip’s First Episcopal Church beneath the Pride of India trees that lined both sides of Meeting Street.” This is where Sarah taught the “Colored Sunday School.” The most elite members of Charleston society belonged here and paid for the privilege of renting pews closest to the altar. A view up Church Street at St. Philip’s. The Grimkés would have walked right down this street when they lived in the Heyward-Washington House. 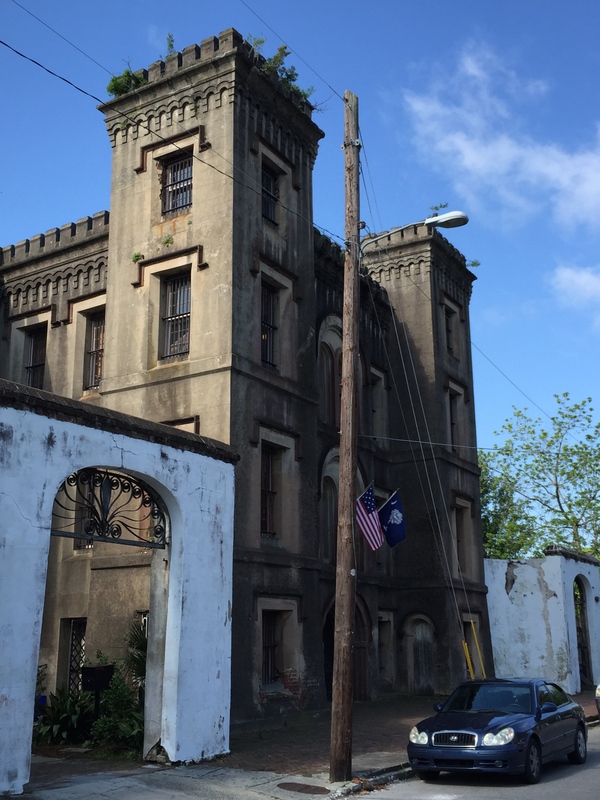 The Old Jail on the corner of Franklin and Magazine Streets in Charleston. You have to appreciate the foreboding architecture. Right next door the the Old Jail, to the left of this photo, is where the old Work House once stood. Runaway slaves who were captured were brought to The Workhouse, along with disobedient slaves. The slave owners paid the city for their stay and their punishment. 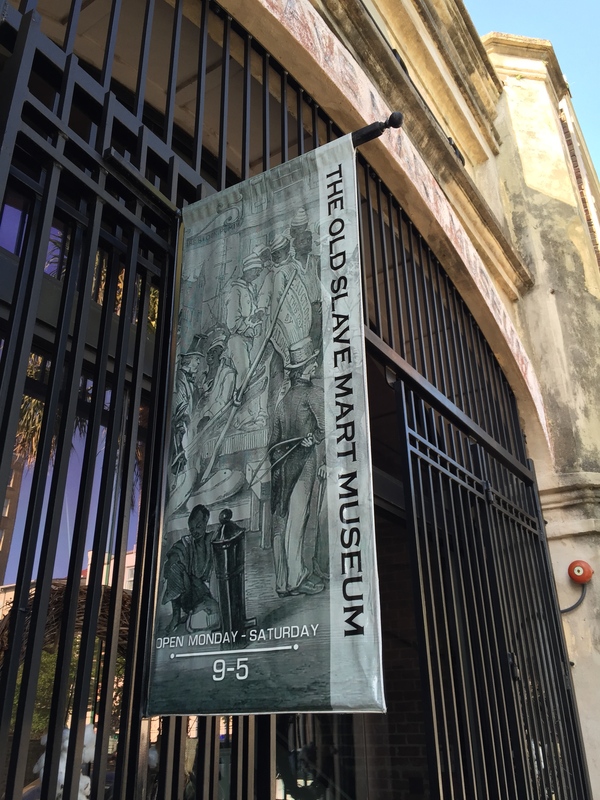 No visit to Charleston’s historic sites would be complete without a solemn tour of the Old Slave Mart Museum at 6 Chalmers Street. 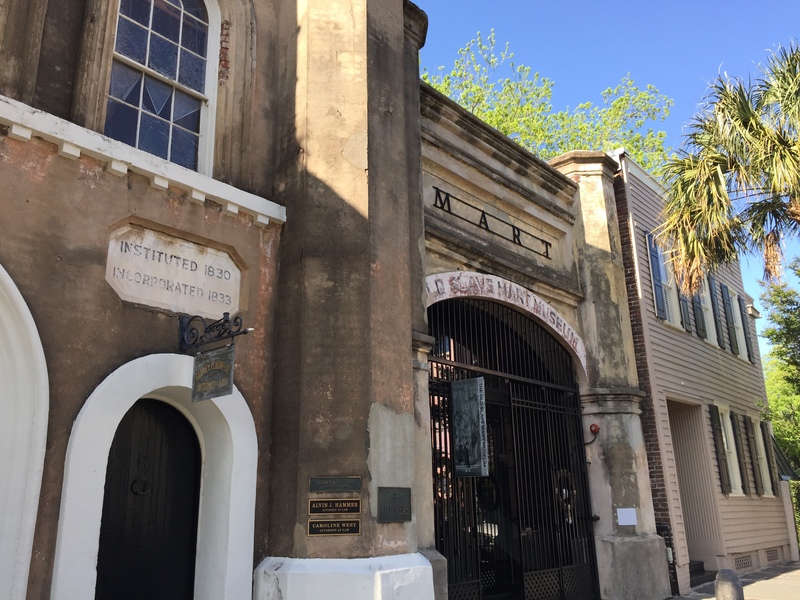 Although this slave market did not start up until the 1850s, well after most of the events in the book, the museum there contains a great deal of the slave history of Charleston. Of particular interest to readers of Inventions of Wings is a display which shows an invoice from the Charleston Work House to a slaveowner for services rendered. The invoice shows the dates and the punishments rendered to a slave, including the treadmill and what appears to be “salt” in the wounds. In 1856, Charleston prohibited the sale of slaves in public. The spectacle of public sales inflamed passions and invited criticism, so it was decided to bring slave markets indoors. 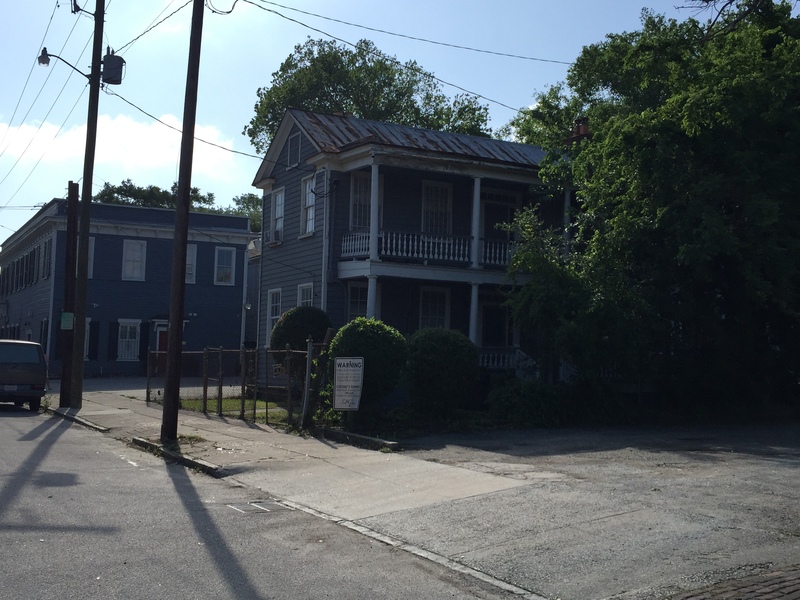 At the same time, Thomas Ryan, one of the Charleston aldermen who introduced the ordinance, bought this property and opened the Ryan Slave Mart, from which he would personally profit. The main room was a showroom in which available slaves were on display. In the back, in buildings which have since been torn down, there was a jail and a morgue. 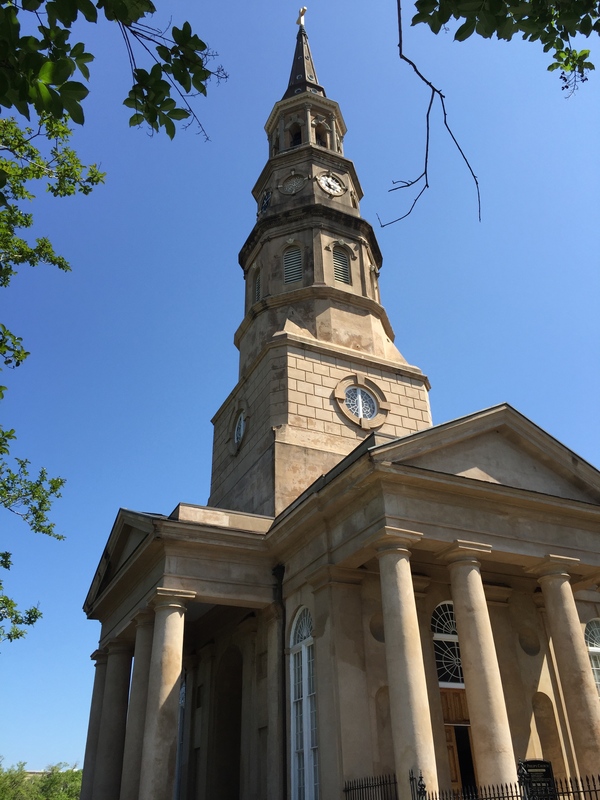 For too long, the Grimké sisters have been lost in the complicated sweep and prejudice of Charleston history, but thanks to Sue Monk Kidd and the efforts of many well informed and inspired local historians, they will soon receive the attention they deserve. I can’t wait to see what their historical marker will look like. 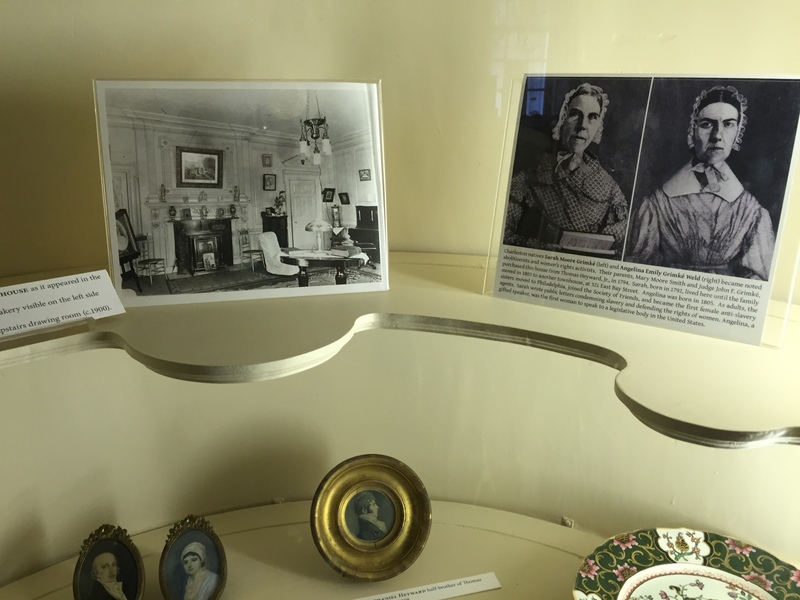 This entry was posted in Literary Travel, United States and tagged Angelina Grimké, Book club travel, Charleston, Grimké Sisters, Grimké Sisters Homes, Invention of Wings, Literary Travel, Sarah Grimké, Sue Monk Kidd by americangirlsartclubinparis. Bookmark the permalink. This was a great pictorial with text. Much appreciated for those of us in the Lowcountry!